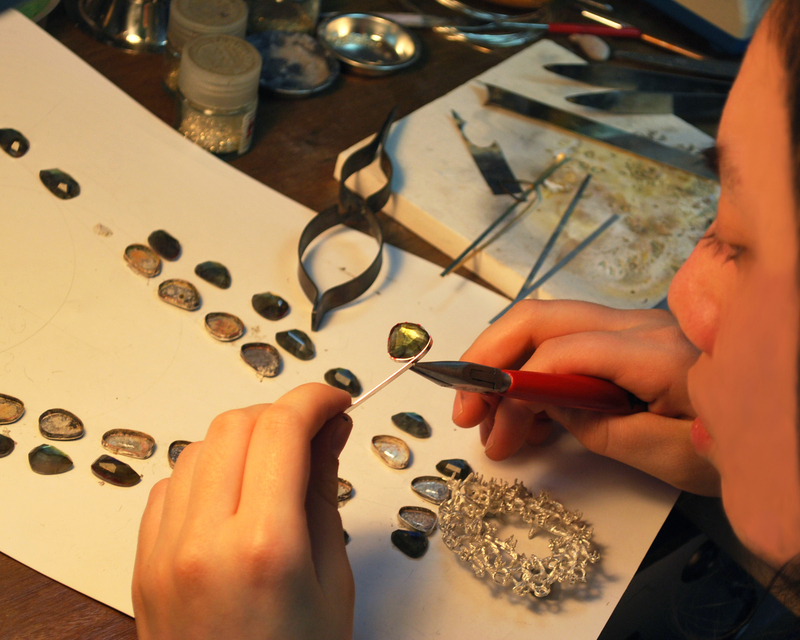 The stone setting training program will introduce students to the tools and techniques involved in stone setting, opening up a versatile and colorful field in jewelry making, allowing them to incorporate sparkling elements in their pieces. The class will start by measuring and calculating the stone dimensions. We will then be preparing various metal surfaces for setting; this involves measuring, filing, sawing, drilling and cleaning. These processes must be performed with extreme accuracy due to the precision needed when working with gemstones. After the preparation process is complete, we will move on to the usage of hand tools. Students will start by practicing with building bezel settings for round shaped and cabochon stones. Additionally, we will go over building pearl setting cups with decorative patterns. These projects provide hand control training and familiarity with tools, both of which are essential when making settings look clean. After this, the students will move on to more complex bezel settings for marquise, pear and cushion stones. For attendees with basic prior experience in stone setting, it is recommended to start with crown/coronet and prong settings.